After a game day feast of nachos, wings and dip upon dip, it’s time for something sweet. Get your Super Bowl dessert fix from these salty-sweet, beer-friendly, pretzel-flecked sweets. These bars were inspired by the candy and snacks you’d mail to a homesick kid at summer camp. A tribute to chocolate-covered pretzels, this luxe tart hits just the right salty-sweet note. These delicious ice cream bars have a crunchy crust made with pretzels, digestive biscuits and walnuts. Christina Tosi, the sugar genius at NYC’s Momofuku, makes an irresistible party mix with pretzels and chopped up mini chocolate candies. Eat these easy-to-make snacks on their own or pair them with ice cream. These vanilla cupcakes are frosted with chocolate and topped with caramel sauce and crushed pretzels. 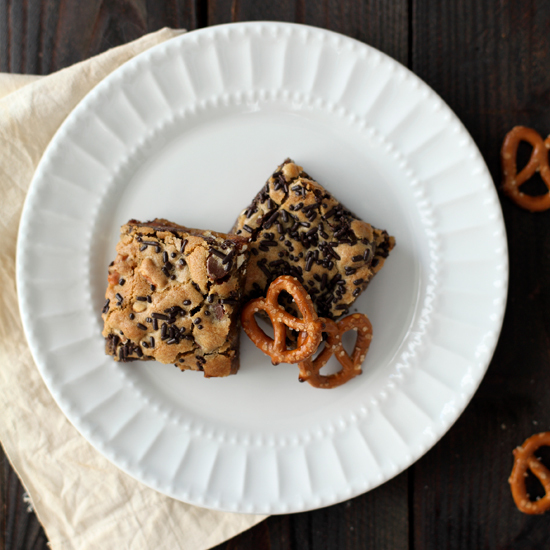 A pretzel lover’s dream, these bars are super-fudgy on the inside and impossibly crunchy on top. This recipe is a great way to use the broken pieces left in the bottom of a bag of hard pretzels.